Thanks for a great summer! 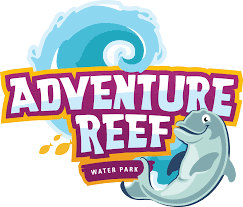 Adventure Reef Water Park is now closed for the 2018 season. We will reopen on May 25, 2019. Early Bird Pass Sale Going on Now! This 3-acre outdoor aquatic facility, built in 1990 and renovated in 2011, is open from Memorial Day weekend through Labor Day. 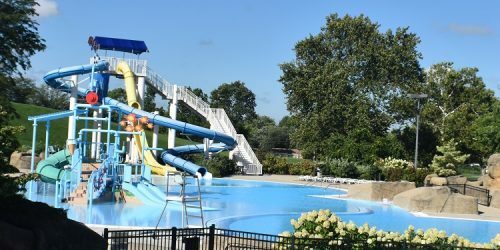 The water park features the highest and fastest slides in Montgomery County. 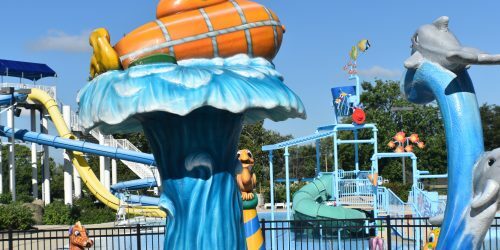 Additionally, a splash pad, large water playground and plenty of deck seating and chairs greet water park guests. Pass holders enjoy special benefits at Adventure Reef including early entry, exclusive use of the park on Sundays. Pass holders also receive food drink specials at the concession stand. NOTE: The Early Bird Pass Sale is going on now! $5 off Individual passes and $30 off Family passes (the prices listed above DO NOT reflect the discount). CIL Members: receive 20% off the adult pass rate. This pass may be applied to all public swim sessions at the Adventure Reef Water Park and KRC Main Pool and allows access to the walk/run track. Adult pass holders also have access to the whirlpool, sauna and steam room. Passes are valid May 25 - September 2, 2019. Passes will be sold at a mid-season discount beginning July 15, 2019. The Water Park and Main Pool will transition to a Limited Hours schedule beginning mid-August.